Want to come along to the Club to ‘have a look’, then please feel free to drop by. You’ll find the club in use most evenings or weekend afternoons from mid-April through to mid-September, and there is plenty of seating around the green for spectators. During the winter months the club has reduced opening times (see Bar Opening Times for details). 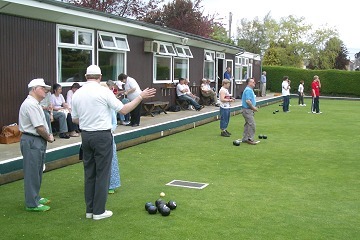 To try your hand at playing bowls, you will need to be accompanied by a full bowling member. New bowlers are encouraged to take advantage of the free coaching on offer and you’ll always find other bowlers prepared to offer guidance and encouragement. Speak to one of our bowlers, who can arrange an introductory session with a club coach for you. Everything you need to play, bowls, overshoes, mats and jacks are provided for beginner bowlers to use. The Club annually holds an open day one Saturday every May, which provides an ideal opportunity to come along, try the game and take a look around the Club. New members are welcome at any time, not just at our open days, but don’t leave it too late – remember our playing season comes to an end by early September. For friendly games, you will need white clothing – white trousers or skirt, white shirt or blouse, white belt and other white clothing as required, depending on the weather! For certain matches, grey trousers or skirts may be required. You will also need to wear special flat-soled bowling shoes. Although slipovers are available for beginner sessions, it would be wise to borrow or purchase a proper pair of bowls shoes. It’s probably not a good idea to go out and purchase your own set of bowls immediately. The Club has a stock of differently-sized bowls for beginners to borrow, and it is wise to experiment to find the most suitable size for you. When you are ready to buy your own woods, you may prefer to purchase a second-hand set rather than buy brand new. Club noticeboards, eBay, Gumtree or similar internet sites, classified ads or some bowls shops offer opportunities to acquire second-hand bowls. Alternatively, a new set will cost anywhere between £180 and £350. 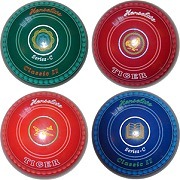 Bowls come in matched sets of four. Various sizes, weights (and colours) are available, within certain limits. Each bowl is shaped (not weighted) to make it follow a curved path. This is called the bias – and again the amount of bias must be within certain limits. Most bowlers will be happy to advise you on choice of bowls, but as personal preference plays a large part, expect some conflicting recommendations!